This time it’s a post discovered by BuzzFeed. Reid posted a link to the conspiracy film, 9/11 Loose Change. BuzzFeed then devoted about 500 more words writing about the old Reid post than Reid actually wrote 12 years ago. And you knew it was a “balanced and fair” piece when they referenced the Barr tweets at the end of the writing. I might have posted this before, but there’s an updated version of a documentary now called “Loose Change 9/11.” The fundamental question is: do you believe the official story of 9/11? If you do, great. If you don’t, then everything that happened after that is called into serious question. Even if you’re agnostic, or you tend to believe that al-Qaida attacked the World Trade Center and Pentagon and that the government had no warning such a thing could happen, it’s worth taking a second look. Here’s the link. 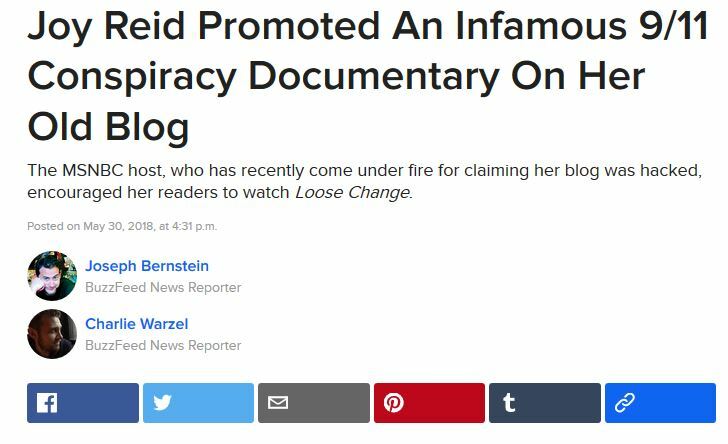 Now, Reid gave the video more credibility than others did, but she didn’t become a birther and start spouting InfoWars at this point. She never referenced the video again as far as I’ve been able to discover. In fact, if you look at all her posts from March 2006, you’ll find that she covered an enormous range of topics: from Brokeback Mountain, to Naji Sabri being a CIA source, to George Clooney getting into a huff with Huffington Post, to Walmart paying bloggers (ah, those were the days), to some kind of conservative baby boom. As you can see from the number of articles just for March, Reid posted frequently, and mostly about topics that were in the day’s news. Like so many other webloggers of the time. I’ve had several weblogs and, thankfully, the Wayback Machine has captured bits and pieces from all … except the very first. My first weblog was using a Userland weblogging system, and the old posts were overwritten in the Wayback Machine. If they had still existed, you would have seen my thoughts just after 9/11. And my thoughts at the time were not something I’m proud of today. Right after 9/11, I hated Muslims. I blamed all Muslims for what happened on 9/11. I would get into battles with commenters who tried to open my eyes to the ugliness of my grief-stricken bigoted rants and I would push back on everything they said, because all I could see was that last plane hitting that last building and the buildings collapsing. I could have fit right into a Trump crowd at that time. I was so angry, I probably would have even embraced a Trump Presidency if he had promised to exact revenge on anyone and everyone even remotely connected to the attack. I’m not sure what stopped me, brought me to my senses. Time, maybe. It takes a special kind of dedication to hold hatred in your heart over time. And I like to think I just don’t have that kind of dedication in me. What I wrote then, is not who I am now. My writing reflected not only the time, but the context of the immediate actions leading up to the writing. And it reflected the profound grief and shock I experienced from the events that long ago day. I’d hate for some word jockey to come along now and dumpster dive through my past writing, dig these up, and then expose them as somehow being representative of what I am today. Yes, they were my words, and because they were, they are a part of me. But they’re stepping stones from the past that I’ve trod in the journey to become what I am today: someone who tries really hard to be open, to be fair, to be decent. Nothing I’ve read that Reid published long ago comes even close to the ugliness of my writing in my earlier weblog. So people will have to excuse me if I don’t jump on the ‘fair and balanced’ journalism bandwagon to rush to condemn her. BuzzFeed, and the publications that followed its lead, have done a huge disservice to those who have published online for years. They have done a disservice to journalism. Somehow in a rush to show that publications are ‘fair and balanced’, they seek to ‘balance’ the coverage of the recent Roseanne Barr tweets by digging up 12 year old posts from a popular progressive journalist. If they truly want to be balanced, than what they need to do is wait 12 years and see what Roseanne Barr is tweeting about in the future and compare it with what Joy Reid says today. Or maybe they should just stop dumpster diving into our past and let our actions today speak for who we are. Joy Reid has issued a graceful apology for her past writings. This won’t be enough for Fox, who wants blood for Roseanne Barr, but it should enough, even for the kids at BuzzFeed. Appreciations to Charles Johnson, of Little Green Footballs fame, for sharing this post on Twitter. We share the same evolution. I particularly want to note the excellent work by Professor Michael Nelson, from Old Dominion University.